You will then need to complete the Texas drivers license application form which you can get at the license office itself. Next you will be required to supply proof of registration of a Texas vehicle, and proof of insurance or financial responsibility. If a motor vehicle is not currently owned by the license applicant, there will need to be a statement affirming that fact. Application will need to be in person can be done at any office that provides drivers licenses. You must make sure you bring the documents required along with the associated payments that will be due. At this time you will be also required to pass the knowledge and the driving examination. This is unless for some reason you are exempt. Those applying who are less than 25 years of age will additionally be required to take and complete a Texas certified education course prior to making their application for their initial Texas drivers license. Teen drivers need not only meet the regular requirements of application for a license in Texas, but if they are 17 and under, they must also comply with conditions associated with the Texas Graduated Drivers License, or GDL Program. Texas employs a learners license system which gives new teenage drivers an opportunity to hone their driving skills prior to them obtaining what is called a provisional license in the state. 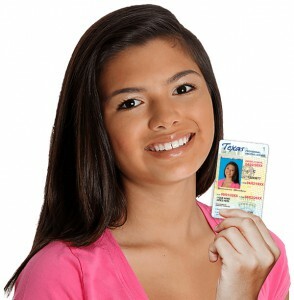 This learners permit will automatically expire when the applicant turns 18 years of age. With this permit, a teenage driver may only drive a motor vehicle when a properly licensed driver who is 21 years of age or older accompanies them in the front seat of the vehicle. Teens who are 15 years or older may apply for this learners permit, assuming they have met the other requirements for licensing and have completed an approved Texas drivers education course. There are occasions when a Minor Restricted Drivers License (MRDL) may be applied for. This is a license that is known as a “hardship license” and may be given to a person who can demonstrate a significant need to circumvent the rules. This temporary hardship license will expire on the date of the next birthday of the applicant. Persons who are under 18 will be issued licenses that will be designated as “provisional”. The licenses expire on the holder’s 18th birthday. Are You a New Resident of Texas? If you have recently moved to Texas and hold a license that is still valid from another state, contact the Texas DMV for the latest regulations on when you should apply for a Texas drivers license.